It was a classic case of the battery warning light coming on in this 2003 Chrysler Sebring with a 2.7L engine. The alternator was failing. Time to get this car home and replace it. The driver didn't make it before the battery ran out of juice. 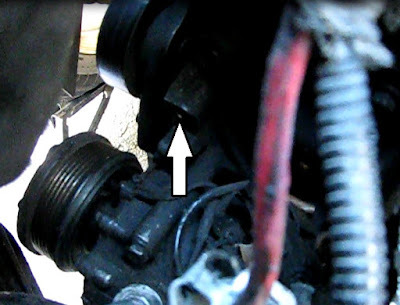 This post details removing the bad alternator and installing a replacement. Cost of parts: Alternator $126.73 new. Junkyard part or rebuild may be available. There it is. Now lets get it out! 1) Drive the right front wheel up on a ramp or jack it up and set it on secure stands. 2) Disconnect the battery. Unbolt the negative terminal on the driver's side strut tower with a 15mm wrench or socket. 3) Unwire the alternator. The large Battery plus (B+) wire is bolted on with a 13mm nut. The control wire has a snap-in connector. Undo the locking tab and unplug it. 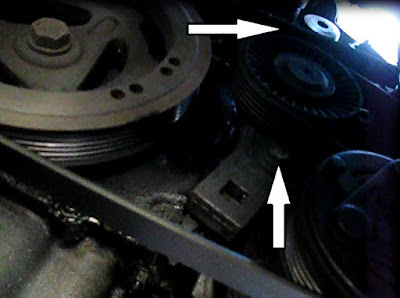 4) Remove the drive belt. Tension is provided by an idler wheel on a slotted bar held by two 13mm bolts. They only need to be loosened and then the wheel can then be moved to the left, releasing tension on the belt. 5) Unbolt the alternator. There are three 13mm mounting bolts. The upper two are right there and easy to remove. The lower bolt. has to be done by feel as it is under the alternator and above the AC compressor. A 3/8" swivel adapter will be helpful here. We had a right angle tool just right for this situation, but these are not common. 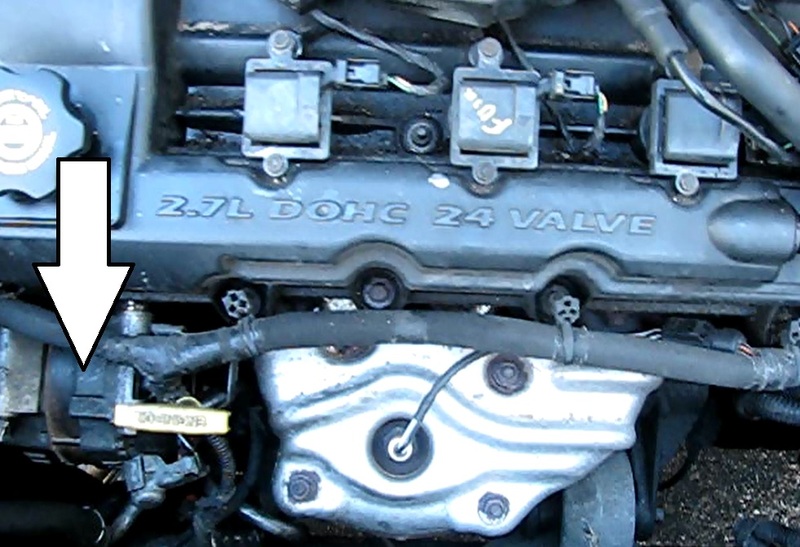 6) Remove the alternator through the top of the engine. It is a close fit and some twisting and turning and returning and rotating will be needed to get it through. We found loosening the oil filler tube to be helpful to get that little bit of extra room needed. 2) Start all three 13mm bolts and turn in finger tight. When they are all in torque them down good. 3) Bolt down the B+ wire and plug in the control wire connector. 4) Reinstall the drive belt. It goes over the alternator, then around the tension idler wheel, then around the AC compressor and finally around the crankshaft. Use a 1/2" square drive ratchet to hold the tension on the belt while tightening the upper 13mm slot bolt. Tighten the lower locking bolt. Check for 1/2" of deflection along the longest straight run of the belt. 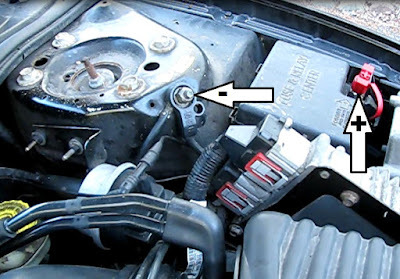 5) Reconnect the battery negative cable to the wheel well with the 15mm nut. 6) Jump start if necessary and test. There should be just over 14 VDC on the battery in the charge mode.